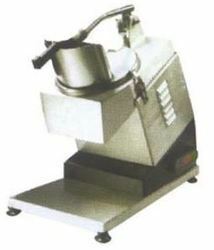 Manufacturer & Trader of Vegetable Cutting Machine. Our product range also comprises of Barbeque Grill, Refrigeration Equipment and Cooking Equipment. Our organization is placed among the noteworthy enterprise engaged in offering an excellent assortment of Vegetable Cutting Machine. Such machine is installed and use at eateries, restaurants, hotels, commercial kitchen and food stalls. This machine is comprises of high quality materials, which offer resistant to corrosion and easy cutting experience. It is manufactured adhering to international industry standards and quality norms. In order to ensure high safety, our professionals opt for strict quality tests made on the machine. Apart from this, clients can get the machine from us at industry leading prices.